When first invited to Mongolia I was told that I should strongly reconsider accepting the assignment if I was a vegetarian. 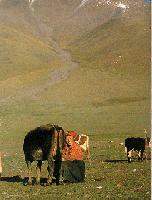 Mongolia is known as the Land of Five Animals--sheep, goats, cattle, horses, and camels. The main meats are mutton(Lonely Planet states that the "smell permeates everything" and that after foreigners have visited they say "it takes weeks to get ride of that mutton smell") and beef. In the cities shops sell: beef, hamburger, smoked hammocks, sausages, hot dogs, and chicken. "The Mongol chickens have been described as 'very athletic'." The city of Ulaanbaatar is offering more variety, but in the countryside only mutton, yak, horsemeat, beef, and camelmeat are available. --from the Peace Corps "Welcome Book." I've read a recipe for Marmot, and hear it is a delicacy in the countryside. The animal is gutted and then cooked by filling it with hot rocks from the fire. I've also read they do this with goat and sheep for special occasions. They also have buuz, which is like a meat ball twisted Hershey Kiss style into a ravioli type pasta, that is steamed. This picture is in a ger in Ulaanbaatar. Also common are fried pancakes made from mutton and flour. Butter, yogurt, cheese and milk can be found anywhere. Sour cream and eggs are usually only found in Ulaanbaatar. Locally produced milk and cream are not pasteurized, and must be boiled before drinking. They have snacks made from dried milk curds called aaruul. I have already had these at my Mongolian friends' house and they have a very …distinct flavor. It is a sort of musty tangy flavor, not unpleasant, but very different. Fish is sometimes available in the markets. In Ulaanbaatar one can find Russian canned meat, canned crabmeat, and canned salmon. "There are some major crops grown in different parts of the country, such as wheat, and a limited variety of vegetables do appear in the markets fairly regularly. While vegetables are usually available, either locally or imported, they still are not popular in the diet. Potatoes, cabbages, onions, garlic, tangerines, apples, cauliflower, radishes, beets, tomatoes, and cucumbers" are seasonal and may only be available in Ulaanbaatar. Ulaanbaatar even has such variety as bananas and kumquats now in certain seasons. Locally made bread and pasta may be available. Out in the countryside they may be non-existent. Vegetables are usually pickled in jars(according to Lonely Planet). The staple grain food is called bordzig, which is a soft pastry made from wheat that is deep fried. Chinese and Russian teas are the two most available beverages. They come in "bricks" made from the left over leaves and stems that are hard pressed into a block. Pieces are then chipped off into water. There is a Mongolian soda-pop that is a citrus juice. Western beer, soft drinks, and even Tang are available in markets. Airag is a fermented horses milk that has an alcohol content of about 3%. Many Mongolians distil it further to produce shimiin arkhi and get it up to 12%. With the Russian influences also comes their love of vodka. There is a big social pressure to drink, especially on men. In the countryside the most common tea is a salty milk tea, that is an acquirred taste. In the winter much needed fat and sometimes mutton will be included in the tea. Lonely Planet suggests you think of it more as a rehydrating soup.